Rated the best fish restaurant in the UK by the Good Food Guide in 2018, Restaurant Nathan Outlaw is a top quality fine dining destination lead by Head Chef Nathan Outlaw himself. 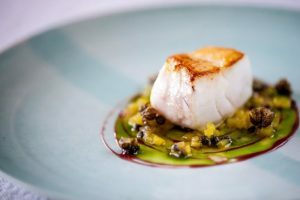 With its 2-star Michelin rating to add to its list of achievements, it is undoubtedly the best place in Great Britain to experience local seafood fine dining. This intimate eatery is situated in Port Isaac, Cornwall along the coastline and proves that mood is the essence of enjoyment. The oceanic backdrop creates a welcoming scalene for locals of and visitors to the area. The atmosphere of the water inspires the simple and serene decor of the seaside cottage where excellent fish dishes are cultivated with detail. The restaurant works from a flexible menu, with dishes varying from day to day based on the fresh produce sourced from local fishermen along the coastline. This sustainable way of cooking gives way to a wide range of signature dishes. The Seafood Tasting Menu is a perfect way to get acquainted with flavours unique to the area. From a starter of Cured Brill, Peas and Mint to a dessert of Malted Orange Profiteroles and Chocolate sauce, each course on the tasting menu is paired with a specially chosen wine from countries around the world. Nathan and his team pride themselves on paying attention to respecting the act of preparing and serving fish in a celebrated way. This diligence carries through to each meal with a personal touch.